Whether you’re a transit nerd or anyone in the Valley who’s only owned a car, yesterday’s announcement of the concepts for the Sepulveda Corridor has to make every Angeleno giddy. While we’re nearly a decade away from making this a reality, a viable transit link from the Valley to the Westside probably ranks around the Dodgers winning the World Series (we’re still getting used to the Rams being back). Eventually, the line will hook up with LAX which isn’t scheduled until 2048, I’ll be focusing today on phase one, which is supposed to make it out to the Expo Line before the Olympics in 2028. Initially, there were six loose proposals that have now been refined in three featuring heavy rail and a fourth in monorail form. The original proposals didn’t include the Van Nuys Metrolink Station, but all the new options do. 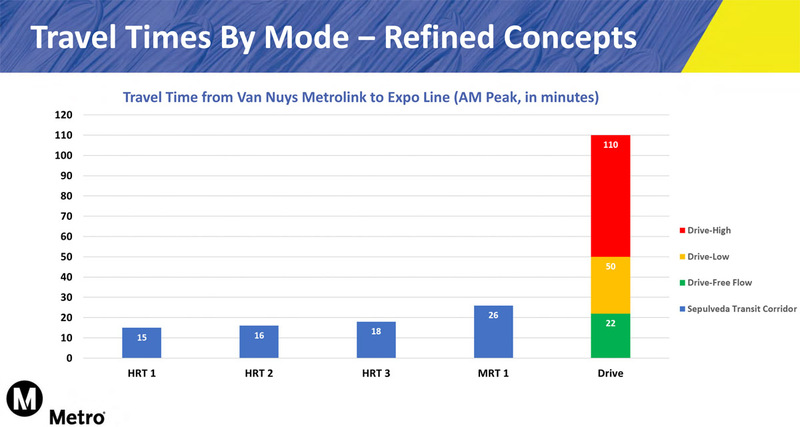 That’s because ridership projections for the future East San Fernando Valley Transit Corridor show it’ll be over capacity as it reaches this point heading south. The earlier ridership projections were somehow generally higher, even with choices having fewer stations. That even held true with some of the slower light rail options. 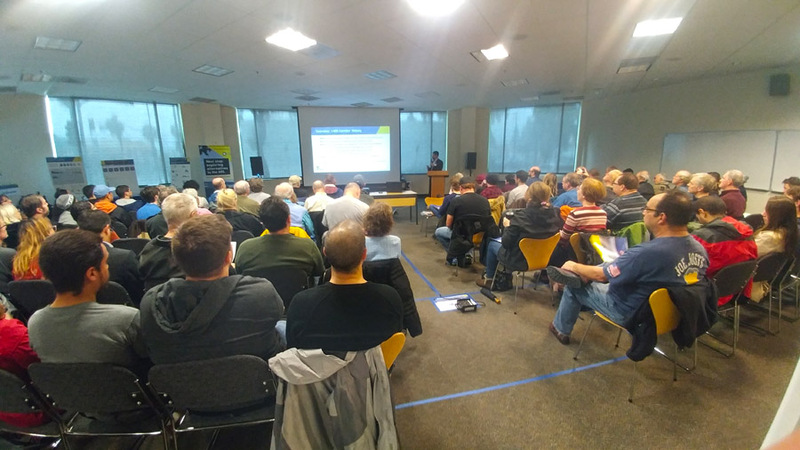 Before picking apart these new proposals, it’s important to know that they’ll all connect with the future ESFVTC and will cross the popular Orange Line Bus Rapid Transit with upgrades ready by 2025. 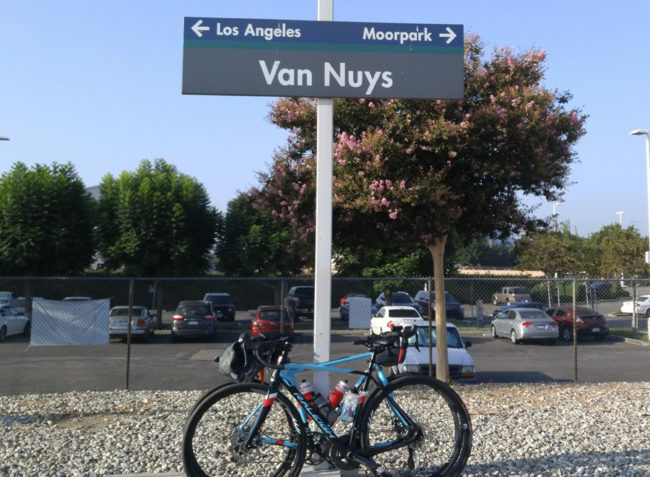 As for the Sepulveda Corridor proposals, all options begin at the Van Nuys Metrolink Station which will definitely improve its viability, as well as a growing Panorama City (I don’t think it’s a coincidence two CicLAvias have been hosted there). The first question everyone always seems to ask is how long will it take to get there? I was pretty shocked by the numbers because even the slowest choice seems to get you there pretty fast. Between the three HRT options, the routes range from 15 to 18 minutes which sounds amazing considering it takes 24 minutes on the Red Line to get from NoHo just to the 7th Street Station even though it’s a shorter distance. The monorail chimes in at 26 minutes, with a little perspective doesn’t sound like much especially when you think it’ll take around 20 minutes to get to the Westside from the Orange Line junction. Really what you’re looking at is who will these lines serve the best even with limited choices of stations in the Valley. The monorail and the third heavy rail option share a similar path heading west along the train tracks turning south on Sepulveda on a preferred aerial route with the main difference of the monorail following the 405 through the pass before tunneling into the mountains. If you’re familiar with that intersection, this isn’t exactly a focal point of the Valley and even less so since they tore down the Foster’s Freeze I visited daily in high school. The only thing to question is how well the Sherman Way / Sepulveda intersection will serve people as a whole. Although they share the same route, strangely they offer the biggest discrepancy between ridership projections. I don’t know much about what capacity a future monorail can hold, but projecting to serve 30% less passengers serving the same stations is significant. The biggest advantage these two options is cost because building above ground is cheaper than going under. While I’m not goo goo ga ga over these choices, I’m nowhere close to being infuriated by them either. Instead, I’m focusing on the first two heavy rail choices as the most viable options. They are pretty much the same stopping both along Ventura Blvd. & the Orange Line, but option one goes completely down Van Nuys Blvd. while the other crosses over to Sepulveda after the Metrolink Station. I’m not entirely in love with number two because of the limitations of the Valley stops. 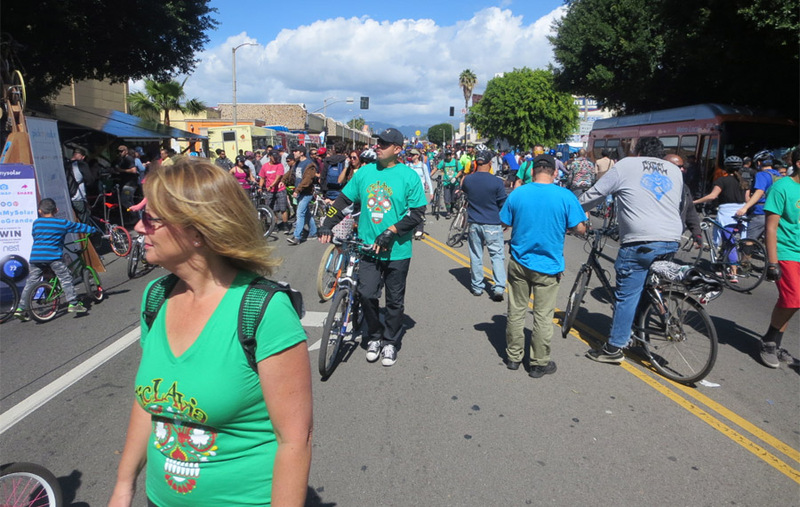 There was a big crowd on hand at the community meeting in Van Nuys this past Saturday. Along the Orange Line, there’s a big Metro parking lot that’s already difficult to reach because of the popularity of nearby businesses like Costco and LA Fitness, let alone people using Sepulveda as a 405 alternative. To me, this location was chosen to placate drivers coming off the freeway which is a bad choice as the roadways surrounding the station aren’t configured well to handle exponentially greater volumes of cars. Coming from the north, you would first make a left turn onto Haskell before making another onto Victory followed by a right onto a clogged Sepulveda to reach the station. If you’ve driven it before, you know it is a mind numbing experience trying to get through and if the only reason for picking this site is because you can put the biggest parking lot there, then we’re not as forward thinking as we could be. Meanwhile, the Van Nuys Orange Line stop makes a lot more sense. It’s just a stones throw from the government center which is busy during the day and already impacted by parking. The existing corridor is also sized on a more human scale with many affronting businesses. Choosing Van Nuys for the Sepulveda Corridor also jibes with the future ESFV for people utilizing the Sherman Way, Vanowen or Victory stops. 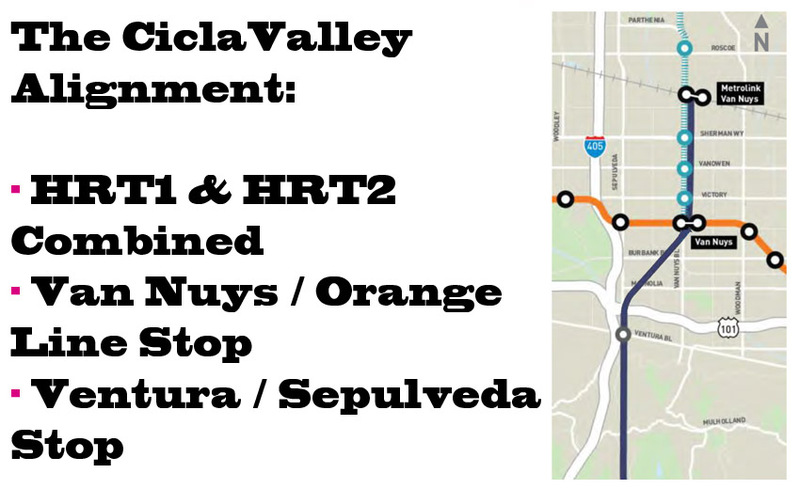 If Sepulveda is chosen, they’d have to exit to take the Orange Line and have to transfer again on Van Nuys or go up to the Metrolink stop and backtrack. This is just adding time for a population that would benefit from more transit. The distance between these two stops would be a mile, meaning it could be covered by bus in no more than a couple of minutes and there’s great potential to bike with the future grade separation planned with the Orange Line improvements. Comparing the two options along Ventura Blvd., you would give the edge to Sepulveda for a number of reasons. There’s already a great amount of activity at this intersection with the Galleria and a number of high rises abound. 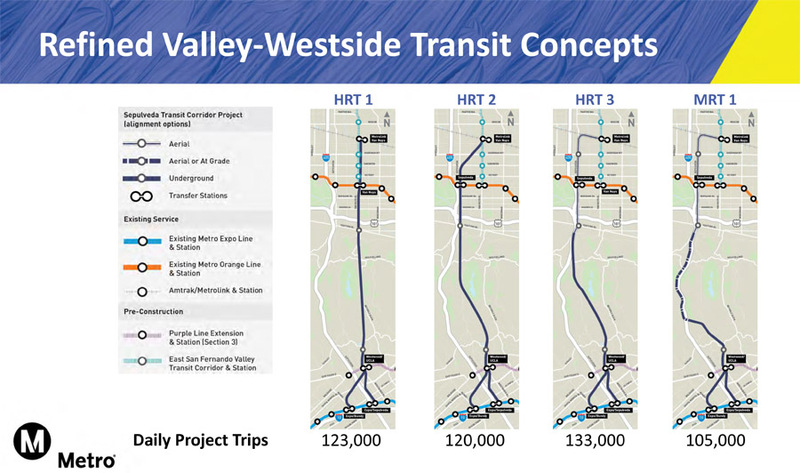 Sepulveda would also offer better bus access for those needing connections in the pass and people utilizing the Rapid Bus on Ventura coming from the West Valley. The Van Nuys option had potential as it is near spaces that could be great mixed use centers, but that future is much further away. Picking between the first two options for the Sepulveda Corridor means there will have to be some type of compromise somewhere, but do we really need to? CiclaValley’s grand suggestion is to combine both of them by stopping first at Van Nuys and the Orange Line then jogging diagonally to Ventura / Sepulveda to maximize usage. This idea is from the KISS school of Keep It Simple Stupid. This route would be in line for cost and travel time for the other two options while getting the most bang for your buck. Make transit available to places where people want to go, not where you hope they will. For the people wishing to drive for the closest access to the 405, you’re living in the world of marginal gains. No matter how big of a parking lot you build at Sepulveda and the Orange Line, that doesn’t change how many cars can fit through through these streets during peak traffic. 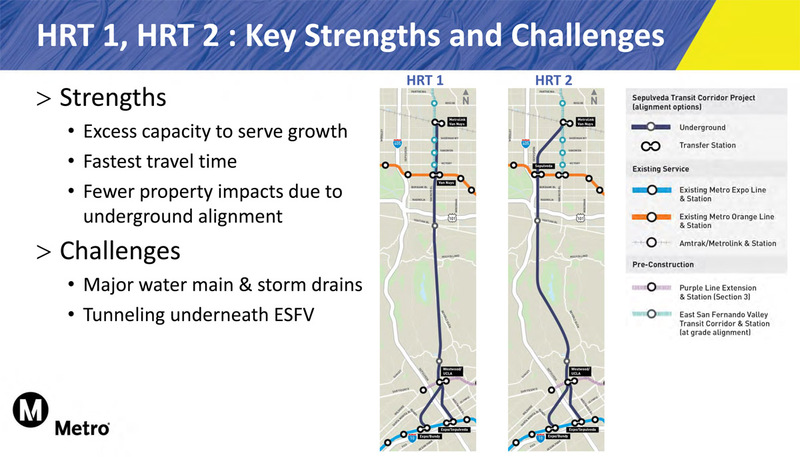 The Sepulveda Corridor offers so much of a reduction of commute time that taking the Orange Line, ESFVTC or Rapid Bus line to get there will still be a big win over mulching along in a car. With all the new transit coming online in the Valley, we have to stop thinking about serving only drivers and get into the mindframe that other transit choices can be your first option. Finally, we may have a system that allows that to happen.